By DJ Salinger, LAS VEGAS – In a shockingly awesome turn of events, after months (years?) of extended refusal on the part of Led Zeppelin singer Robert Plant to rejoin the band, remaining Zeppelin members Jimmy Page and John Paul Jones finally figured out a way to sort of change his mind. 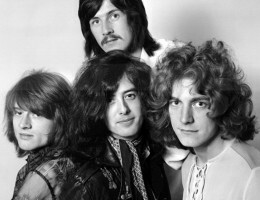 “Every time I’d ask Robert to give it another go as Led Zeppelin and hit the road for a grueling world tour he’d say no, and beg off, citing the fact that he’s 80 now and can barely move, let alone sing or lie awake for nights on end in the back of a van for months on end,” quipped Zeppelin bassist Jones, who at 76, is the baby of the band. “But then one night Jimmy said he’d seen a bunch of geezers down at the pub covering Zeppelin songs and I thought, that’s it – what if we just ask him to do a cover band of the songs? The nutty idea seems to have worked as “Led Zepplin” have started playing shows after they get off work from their day jobs as security guards, baristas and so on. Page says if they can get a following they may tour the tiniest most crap parts of England in a small van and constantly fight over the proceeds of each show. “It’s just really great to be playing the songs again,” said Page, 28. Asked if Zepplin might whip out any other covers by different bands, Page said he and Jones had been “thinking about maybe doing some early Rush” but that Plant had, perhaps predictably, vetoed it. This entry was posted in Thinking Man's Rock and tagged classic rock reunions, dj salinger, england, jimmy page, john paul jones, led zeppelin, led zeppelin form led zeppelin cover band, led zepplin, rush, the brutal times robert plant, van. Bookmark the permalink. Hmm. To go around saying stuff like that at school is both offensive and rude. I’m just glad they got back together for that extremely expensive 02 show. What a great cause. I heard they are touring small Seattle venues amidst the splendor of Belltown elites. The The Asian Hip Hop weekender’s are up in arms.